Having the perfect body and an attractive face is what everybody will agree is the wish for them. Advancing age tends to affect the skin and the appearance of the body and face in people. Cosmetic surgery at Cocoona Center for Aesthetic Transformation at Delhi is performed not only to effectively hide the signs of aging but also to improve the overall appearance of the body. What are the types of Cosmetic Surgeries? Rhinoplasty – This is the most common type of facial cosmetic surgery performed today. It is also commonly referred to as a ‘nose job’. This surgery aims to improve the appearance of the nose by changing its size and shape to be more proportionate to the other facial features. Facelift – This is another common facial cosmetic surgery procedure and is performed mainly to hide the signs of aging from the face by reducing the wrinkles on the face. Eyelid surgery (Blepharoplasty) – This is a commonly performed facial cosmetic surgery and aims to improve the size and shape of the eyelids. This is mostly a corrective form of plastic surgery and is used to improve the appearance of droopy and unattractive eyelids in a person. Ear surgery – Cosmetic surgery is also used to correct the shape and size of abnormal-looking ears. This surgery aims to clip and pin the abnormally shaped ears into resembling more normal-looking ears. Chin surgery – This is also a facial cosmetic surgery mainly aimed at improving the appearance of the chin. This can be used to decrease the size and shape of an abnormally large chin using surgical methods for improving the attraction factor in the person. These facial cosmetic surgeries are mainly aimed at improving the appearance of the person and to restore youthful looks in them. There are also a large number of cosmetic procedures that are performed to improve the looks as well as restore functions in the limbs after an accident/trauma. Skin Rejuvenation/Resurfacing – This advanced cosmetic procedure aims to restore beautiful and smooth skin by removing the upper layer consisting of the dead and damaged skin cells. This helps to restore clear and youthful skin in the person. Laser hair removal – This is an advanced and long-lasting hair removal alternative for people who wish to get rid of unwanted body hair in long-lasting and effective manner. This mainly uses high-intensity laser light to target the hair follicles and to destroy the roots. This cosmetic procedure can be performed on almost any part of the body. Liposuction – This cosmetic procedure aims to remove stubborn fat deposits from various parts of the body in order to give you the ideal body shape. This is most useful to remove remaining stubborn small deposits of fat in order to achieve ideal body shape. Breast Lift/Augmentation – Breast lift surgery or breast augmentation procedure is one of the most commonly performed cosmetic surgical procedure. This cosmetic surgery aims to improve the size and shape of the breasts to make them look more proportionate and attractive. Tummy Tuck – This is another common cosmetic procedure which aims to give you a flat and fit belly. This procedure works by removing excessive fats from stomach and to make the underlying muscles more pronounced. Body Lift – This is an extensive cosmetic surgery which aims to improve the overall appearance of your complete body. This procedure is useful for removing excess fat from various regions in the body in order to give you a more attractive body shape. These are the commonly performed cosmetic surgeries at Cocoona Center for Aesthetic Transformation in Delhi. Cocoona Center for Aesthetic Transformation in Delhi is the leading the increasingly popular complete cosmetic solution provider in the region. 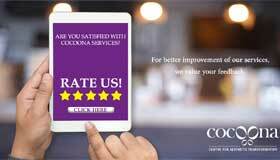 Using advanced and modern equipment the expert cosmetic specialists and plastic surgeons at Cocoona perform hundreds of successful cosmetic procedures each month.